Improving service quality and reducing operating costs are objectives that all logistics service providers try to reach. Now, many products and solutions, such as vehicle mount computers, wireless mobile devices, GPS, vehicle diagnostics and monitoring, are used in the management of fleets, carrying out all requests in the intelligent application of logistics and providing multiple functions such as fleet dispatching and scheduling, vehicle location tracking, and real-time management for freight, driver behavior management, and more. They allow logistics service providers to effectively manage their fleet using regular IT tools such as mobile and real-time systems. Police vehicles and fire engines for emergency rescue at the front line can use fleet management to promote the efficiency and execution of their service, and ensure the security of their officers on duty. Van Lin, the Director of Advantech iService Business Group, indicates that fleet management is a very important part of intelligent logistics, and its prime directive is to optimize management costs. In the past, prior to modern logistics and fleet management systems, administrators found it difficult to determine the status of their vehicles when they left with freight, and it was impossible to reassign new tasks on-the-fly before vehicles had returned to the dispatch center. Now with wireless networks and GPS satellite positioning, f leet management systems are capable of tracking the locations of several vehicles simultaneously, and indirectly determining whether freight has been delivered to the assigned location on time; all this is good but it still does not optimize cost control management. But now, via vehicle mount computers and network systems, administrators can not only can manage vehicles and freight, but can also manage employees. Inappropriate driver behavior can be monitored, such as over speeding or over braking which can rack up costs on fuel, tire replacements, oil consumption and vehicle damage. Tire pressure detection means vehicles can send warning messages to drivers before a breakdown occurs, and this also assures the security of the freight delivery, and decreases insurance and maintenance fees on vehicles. Furthermore, a vehicle mounted system can accurately calculate gas and oil quantities and consumption and prevent drivers from stealing fuel and other malicious activity. In addition, drivers can immediately upload all information to the system in the logistics center as soon as freight has been delivered to the assigned location, and the administrator can accurately control delivery schedules to prevent fines due to delayed freight delivery. In order to achieve real-time management for a fleet, a vehicle mount system requires several peripheral devices, such as wireless communication, satellite positioning, CAN BUS vehicle control systems, sensors and cameras. Plus, thepower supply, shock resistance and temperature of its core computer should be able to overcome harsh environments so it can work normally. Van Lin indicates that in-vehicle computers should conform to several special requirements. For instance, unstable power supplies and excessive noise often occur in old trucks, and insufficient voltages cannot activate its system. Sometimes, when connecting to peripheral devices, an instant high voltage may burn the motherboard, and bumpy countryside roads mean trucks can experience power drop offs or have their computers crash. What’s more, systems which fail to conform to wide-temperature operation cannot work normally in extremely hot or cold weather. All these factors can mean dispatches fail, and in the worse-case scenarios, the system has to be sent back to the factory to be repaired. 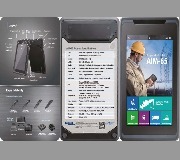 Advantech systems not onlyovercome these through their advanced and rugged in-vehicle hardware technologies, but also transform all the complex data collected by intelligent software into useful information. For example, images with high resolution can be uploaded to headquarters for real-time monitoring, and images can be further analyzed to perform multiple functions, such as obstacle avoidance, automatic speed limiting, driver behavior monitoring, and anti-theft. Regarding connectivity, Advantech vehicle-mounted computers can make the most of Wi-Fi bandwidth and select the cheapest system capable of transmitting the most data over long distances which significantly saves network communication fees for logistics service providers. The application of fleet management can achieve profit maximization for logistics service providers. Moreover, with an advanced vehicle mount tablet computer, it can improve the efficiency of police and fire services who need to maintain social order, prevent fires and provide emergency medical service. The emergency work of the police and fire services can be classified into two broad categories; patrolling, spot checking and maintaining order; and an emergency response service for accidents and disasters. A logistics fleet dispatch system can be used to perform standard vehicle dispatch operations for the former, and for rescue missions which often occur in harsh outdoor environments i n p oor weather c onditions l ike storms with high winds and heavy rains, special designs are needed. Not long ago, we used to use paper maps to search locations; now we use smart phones and tablet computers with satellite positioning built in. However, these kind of commercial products are not designed for special tasks and they can only be used in 0~40 ˚C environments, which means they may not receive signals reliably or suffer interference, plus their poor shock resistance makes them tend to crash or malfunction. 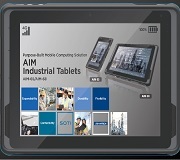 Advantech rugged tablet computers have passed MIL-STD-810G four feet drop tests, IP54, and EN50155 vibration tests, and are designed for harsh environments. They are suitable for multiple applications, including field services, manufacturing, warehousing, factory equipment maintenance, emergency services, and transportation, to name a few. Current customers not only demand that vehicle mount products should be rugged, but they also demand that they should be special-purpose. For example, logistics storage, long-distance container transportation, urban courier service, public transportation, and emergency rescue vehicles—all require unique designs and solutions. Advantech logistics solutions are the smart choice for many different kinds of fleets and logistics industries.